A weekend at the Hotel Monaco and a visit to Mission Street. 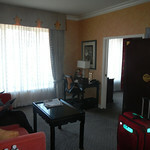 In mid-July of 2012, we spent a weekend at the Hotel Monaco at 501 Geary Street in San Francisco. We have an of photos of our room so you can see what a suite there is like. The hotel is a block from the theatre disctrict and two blocks from Union Square, so it's well-located. It's also across the street from a national pharmacy, so you can pick up whatever toiletries you forgot or that the TSA confiscated. We didn't avail ourselves of all the services offered, so we can't comment on the fitness center or the in-room spa treatment. We did get there in time for the evening wine service, and there was a masseur plying his trade -- he had a list of people signed up to sit in that special chair, so a massage is apparently popular. The Monaco is a Kimpton hotel, so we joined the free email list which got us free access to Wi-Fi during our stay. It was actually useable, a surprise since many hotel Wi-Fi points are seriously underpowered and suffer from no available leases during times most guests are in their rooms. We had the Monte Carlo Suite, which promised a 5-foot Jacuzzi tub; the tub accomodated the two of us side by side, facing opposite directions. It's always nice to have a Jacuzzi in the room. The photo album will show the king-sized bed; the bed room also had an armoir with a flat-panel TV, a radio with an iPhone dock to charge it and to play your music for you, and two tables with lamps on either side of the bed. The sitting room had a love seat, chairs, the armoir with TV and convenience bar, and a desk with outlets for your laptop. 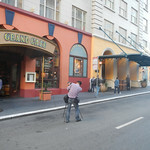 The Grand Cafe is built into the ground floor of the hotel; we've eaten there before, and we like the food and service. We had breakfast there on Saturday, and it was pleasantly quiet and unrushed. We had breakfast at Lori's diner on Powell Street on Sunday - and it was noisy and rushed, just like it always is, but Lori's charged about half what the Grand Cafe did. The Hotel Monaco is what's called a boutique hotel -- 166 rooms and 35 suites, with lots of maids in evidence during cleaning times, adequate staff in the lobby, and two separate seating areas if you want to while away some time downstairs. The furnishings and linens were nice, there was little evidence of the wear and tear we see in high-traffic hotels, and we didn't have people in the hall waking us up at odd hours of the night. On Saturday, we took BART from Powell and Market to 16th and Mission and went thrift store shopping. The Mission District is an area unique to San Francisco (although all cities have unique areas). The area was populated by the indigents, of course, before the arrival of Europeans, and the Spanish made sure to set up missions and save the souls of the poor, benighted Yelamu who'd gotten along for 2,000 without saving, thank you very much. What we Americans would call the Mission of St. Francis of Assisi was established on the lands of the Yelamu, and now we have the Mission District, populated lately by peoples from South and Central America. We have an murals and other artworks along Mission Street. I like the murals very much. They're very well done and reflect the interests of the people who live there. The architecture there is also interesting, especially since it's on a human level, without all the high-rises of central San Francisco and other large cities. The intimate details on Mission Street don't have to meet the economies of scale of huge office towers and hotels. To read more about the Mission District, see this Wikipedia page. We also hung out at Bar Norcini, where we acted the parts of flâneurs; we have a video of life along Powell Street. Powell Street is very busy in this location. The BART and Muni Powell Street Station is a few blocks away, as is the terminus for the cable car. A half block away from Bar Norcini is Union Square, San Francisco's famous shopping area. There is a hostel nearby, and we frequently see groups of travelers in backpacks and hiking boots tramping along between the hostel and the Powell Street Station.